Why go through all that work when you can just buy a jar at the store? Taste. 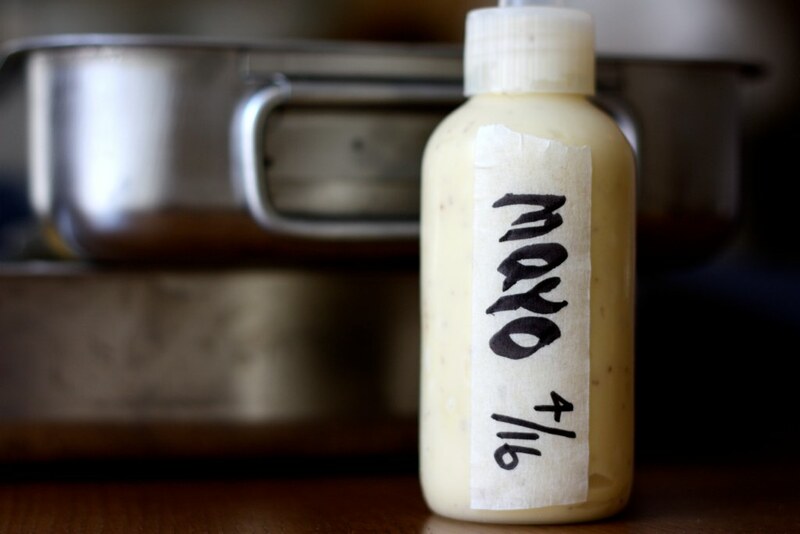 Homemade mayo is worlds better than that unctuous white goo that has been sitting in a cardboard box or on a dusty shelf for god knows how long. The other reason to make it at home is that you can control the taste by adding garlic, paprika, lemon juice or cayenne to your liking. Here is my basic recipe. Drop egg yolks into a blender or food processor. Add 1 t whole grain mustard and pulse a couple times to combine. Slowly, and I mean SLOWLY add the first 100ml of oil, drip by drip. When you are nearing the end of your patience and the end of the first 100ml you will notice that the yolk and oil mixture has started to thicken. At this point you can add the other 300ml in a slow and steady drizzle. At some point the mayo will get too thick to blend. Add a little water, stir and continue to blend. When all 400ml of oil have been added, add the chopped garlic clove, the lemon juice and salt and pepper. Taste and add more ingredients if you wish. Store in a jar or squeeze bottle in the fridge for up to one week. 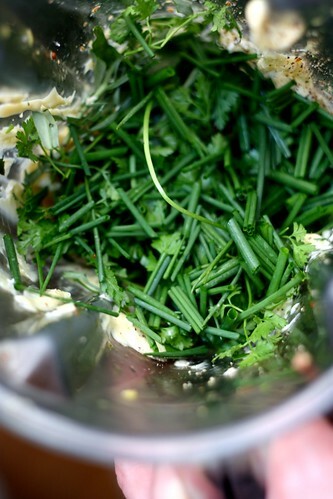 I have included the recipe for Green Goddess Dressing because I always make both mayo and green goddess at the same time. You make the mayo, leave a third of the mayo in the blender and add the other ingredients to make Green Goddess. Green Goddess used to be the top dog dressing in the United States until Ranch Dressing came around. 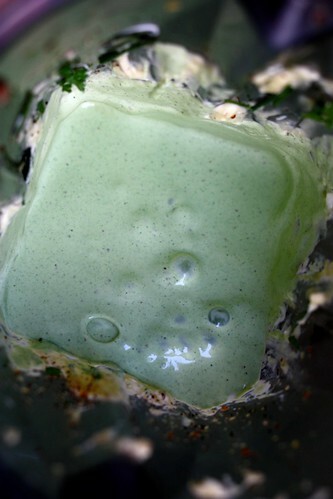 Legend has it the green hued dressing was created at the Palace Hotel in San Francisco in the 1920’s to honor George Arliss’ new play “The Green Goddess”. The dressing is perfect for Spring not only for is color, but also because you can use up all the herbs you have around the house. I like the dressing on a hearty leaf like frisee, but it also works well for tossing on green beans, hard boiled eggs or new potatoes. Add all ingredients to blender and turn on low. 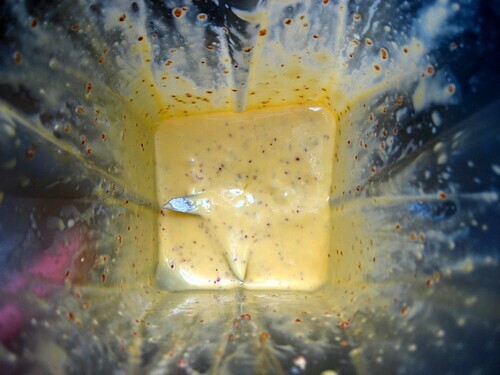 Once combined crank up the blender and allow to puree until the color changes to a pale green. Taste, adjust seasonings and blend again. Pour into a jar or squeeze bottle and store in the fridge for up to one week. This entry was posted on April 20, 2010 at 9:19 am and is filed under Condiment, Recipe, Salad Dressing. You can follow any responses to this entry through the RSS 2.0 feed. You can leave a response, or trackback from your own site. why did I think that Green Goddess always has anchovy in it (which I like)? Hey Wendy, here I just use the paste which is easier to have on hand year round. You could also substitute a couple of canned anchovies or saute some fresh anchovies with a little olive oil and garlic, then add to the blender. For easy mayonnaise see this technique http://www.youtube.com/watch?v=wbeK1-hc8qo. I first saw it on Spanish TV demonstrated by kerazy Basque chef Karlos Arguiñano. I tried it – it worked! I tried it again… it didn’t…Hmmm. But it seems to work often enough and is easy enough to make it worthwhile trying first. It’s important to get measurements right and DON’T MOVE the blender at first. Also, I made the mistake of using really good olive oil which was too strong tasting, so my tip would be to use cheap bland stuff. Probably obvious. mayonnaise is my kryptonite in the ktichen …i have tried so many times and the first batch usually misbehaves! Marv, I have gotten so frustrated some times. The trick is the eggs at room temp and SUPER, SUPER SLOWLY drizzle the oil. It should work every time.